Polo Gomez, 43, wears a crown of needles holding what he said is his own AIDS-infected blood during a protest against the increasing prices of AIDS medicine in Mexico City on June 18. Mexico will host the International AIDS Conference this August. 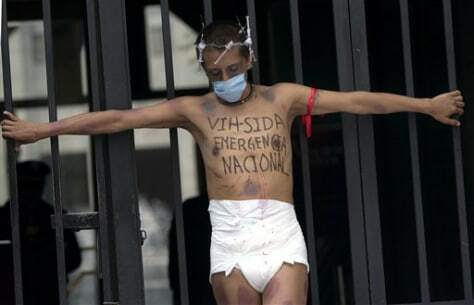 Sign on his chest reads in Spanish "HIV-AIDS national emergency."